An easy strategic plan diagram maker that helps make strategic plan diagrams with examples and templates. Quickly and easily create strategic plan diagrams in minutes. Discover why Edraw is the simplest and easiest, yet most powerful strategic plan diagram maker: Download it Now. 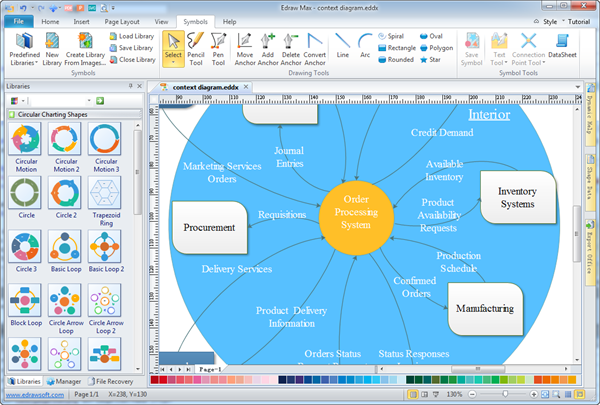 Edraw strategic plan diagram maker is a lightweight yet extraordinarily useful drafting tool. It provides vector diagram possibilities with rich libraries including a wide array of smart shapes and various examples. Even beginners without any drawing skill can handle this tool with ease and obtain professional-looking diagrams. The interface is quite similar with MS Office. Plus, there are dynamic help embedded in the program which saves you the time of learning curve. You just need to drag and drop shapes and they can connect automatically. Apply built-in designed themes, and automatically share your finished strategic plan diagram in various formats to promote team work.